I received a Kindle Fire HD, 8.9", as a Christmas gift a couple of years ago, and on the whole I've been quite happy with it. Battery life could be better, and availability of apps is limited compared to a standard Android tablet or an iPad. While not really designed to be a fully functioning tablet computer, the Kindle Fire HD is a first class device for consuming all types of media with plenty of utility for writers as well. While I don't personally use my Kindle Fire for writing per se, I use it a LOT for skimming blogs and other sources, saving the articles I want to read and ponder in detail, and organizing notes and reference materials. Here are four of my essential apps that I use every day. Docs -- Never overlook the utility of a device's native apps! I use Kindle's built in Docs storage to access pdf documents that I've emailed to my Kindle's personal email address. Once they're in your device's Docs folder, you can store them in the cloud or on your Kindle for offline reading. What's in my Doc folder as I write? Feedly -- Feedly is the newsreader that stepped up when Google abandoned their RSS reader. It serves as a one-stop shop tool for skimming headlines and article descriptions from blogs, columns, and any websites incorporating grab-able feeds. From there I can click through directly to the article at the source. I often skim headlines in Feedly on my iPhone and "save" those of interest for later reading on the larger format of my Kindle Fire. Yes, as you might have noticed, Feedly operates across platforms from Android to iOS to Windows PCs. It's also free -- a paid upgrade is available, but so far I've been happy with a free account. Evernote -- Evernote is simply the best productivity tool out there. I use it to organize everything from recipes (shared in a virtual notebook with my son) to travel documents (shared in another notebook with my husband). Most of all I use it for keeping track of article and story ideas, notes and drafts, and virtual clippings of my work as it appears on the web. Evernote is also a tremendous aid in paper reduction. Hard copy documents can be scanned directly into Evernote for archiving -- as a backup or to save real world file space for truly critical items. 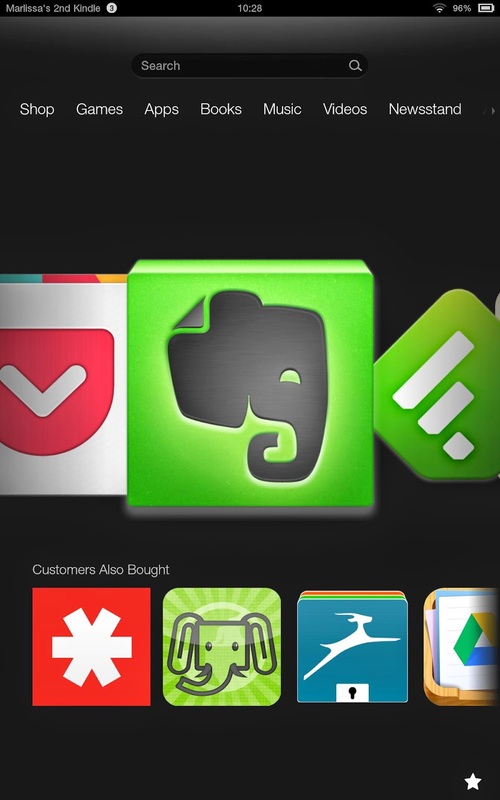 A basic Evernote account is free, but as it is another cross-platform app I use a lot, I do use the additional functionality of a paid account. One drawback of the Kindle Fire version is that it does not allow maintenance of offline notebooks -- a feature that is normally part of a paid account. So, you must be connected to the cloud to have access to your Evernote-stored data. Pocket -- Last but not least, Pocket is the newest addition to my collection of productivity tools. Pocket is another web clipper, but unlike Feedly it doesn't depend on the original site having set up feed capabilities. While Pocket lacks much of the amazing functionality of Evernote, it does allow offline storage of clipped articles to read at your leisure. I use Pocket to clip and save articles I want to read, but not necessarily keep. For example, I might see a link while scrolling through Facebook and save it to Pocket for later reading. Once read, most of my Pocket contents get deleted, though some things I'll then pin to Pinterest or move over to Evernote where they're tagged and saved for future reference.